José Mari Amorrortu (Athletic), Chiara d’Angelo (Milan), Susana Regüela (CAR Sant Cugat) and Pablo Borrás (Estudiantes) were the four speakers that joined Carles Folguera, director of Masia 360, at the Dual Career: Sporting and academic education of the athlete conference, and left the Auditori 1899 at the Camp Nou with a very special gift: a Barça robot made out of recycled material. It’s a symbolic yet priceless item. And also a very original one, made all the more special by the fact that they are made by Joan Hidalgo, a 16 year old boy at the Fundació Itinerarium who suffers from a rare degenerative disorder called ataxia-telangiectasia that affects limb, head and eye coordination and raises the risk of infection. There are only 35 known cases in Spain. But Joan keeps going, and with his father’s help focuses on making robots out of things that other people throw away, which doubles as a way of reminding the world about the need to respect the environment. 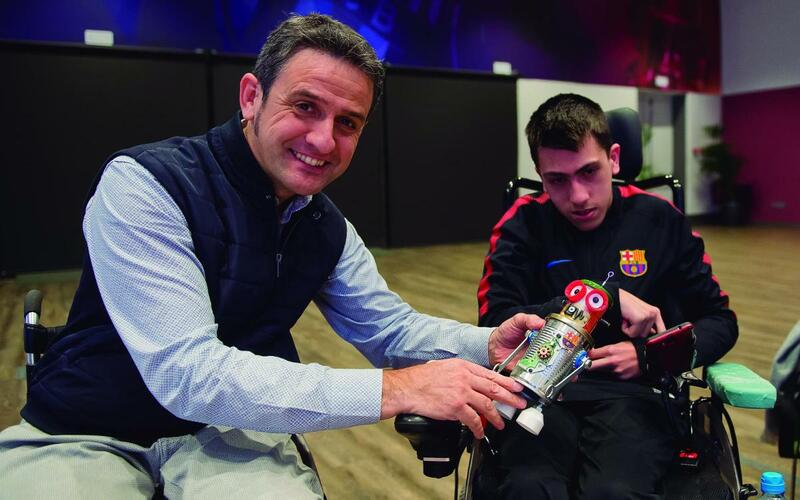 “At Masia 360, we think this is a great idea because Joan and his robots reflect the values that we preach at FC Barcelona” comments Folguera. Last November, Joan presented one of his creations to someone else who knows what it is like to overcome adversity, rally driver Isidre Esteve who has been wheelchair bound since an accident in 2007. Joan is also passionate about Barça, and played in the inclusive teams run by the Fundació Itinerarium. In December, they travelled to Madrid to play at the Festival del Futbol Inclusiu, whose patron is former Spain manager Vicente del Bosque, and played games against Rayo Vallecano, Logroñés and Real Madrid.